With these Las Vegas to Death Valley tours you will explore the hottest, driest, and one of the most fascinating deserts in North America! Read along as we take you on from Las Vegas a virtual tour of Death Valley! The valley, the lowest place in the Western Hemisphere, is located in eastern California, close the border with Nevada, about 2,5 hours drive from Las Vegas. The place is, undoubtedly, a photographer's paradise! Get on board, become a Death Valley discoverer! Las Vegas to Death Valley tours by coach/mini van generally operates September through May and are not available on major holidays. When you want to get off the Strip for a day and enjoy the natural scenery of the surrounding desert area then you should try the Death Valley tour from Las Vegas. Your 11-hour excursion begins with complimentary pick-up service from selected Las Vegas hotels where you will be transported to Beatty, Nevada. Here you will indulge in a free continental breakfast and start your journey through the Mojave Desert. As you are traveling your expert guide will inform you of the cultural and natural history of the sites you will be viewing. Once you’re at Death Valley you will visit the 800-foot Ubehebe Crater and Furnace Creek where you will stroll through the Furnace Creek Ranch Museum. After a eating a box lunch you will drive to Badwater which is 282-feet below sea level and the lowest place in the Western Hemisphere. Your travels continue to the salt flats at the Devil’s Golf Course before going to Dante’s View which boasts panoramic views of Death Valley from 5,000-feet above sea level. 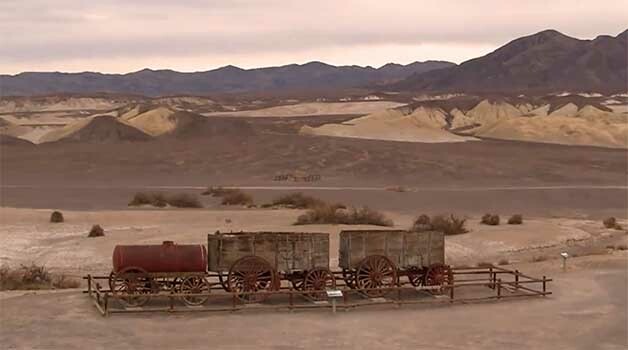 Your final stop on this Las Vegas to Death Valley tour will be a rhyolite ghost town before driving back to Las Vegas where your excursion will conclude with drop-off service to select hotels. Las Vegas to Death Valley tours by Pink Jeeps are only available September through May and are not available on major holidays. The Death Valley Adventure tour is spectacular for the person that is looking for something unique and adventuresome while you take-in the breath taking views of the largest National Park in the Lower 48 States. Your journey begins and ends with hotel pick-up in a SUV that is laid out for comfort. You will stop at the awesome Goldwell Open Air Museum which highlights include a sculpture of Leonardo Da Vinci’s Last Supper. From here you will continue onward to the lowest point in the United States, Death Valley National Park. 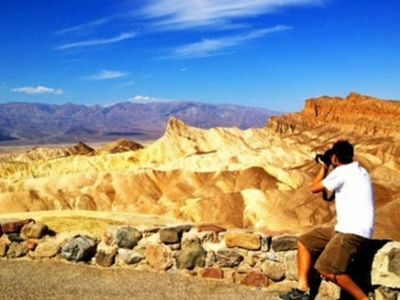 You will observe such gorgeous landscapes like Furnace Creek, Badwater and the Devil’s Golf Course. Lunch is included on this fun packed eight hour tour of adventure. 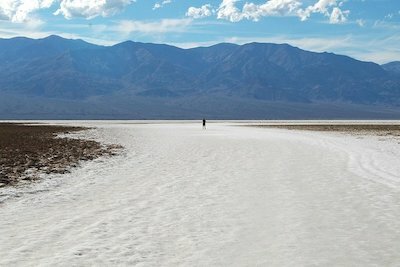 When you want to experience the largest National Park in the lower 48 states that offers a truly unique landscape, then you should try the Small Group Death Valley National Park Day Trip from Las Vegas. Your 10-hour Death Valley tour begins with complimentary hotel pick-up service where you will meet your informative guide who will tell you interesting stories and facts of the area as you relax in the mini-coach. 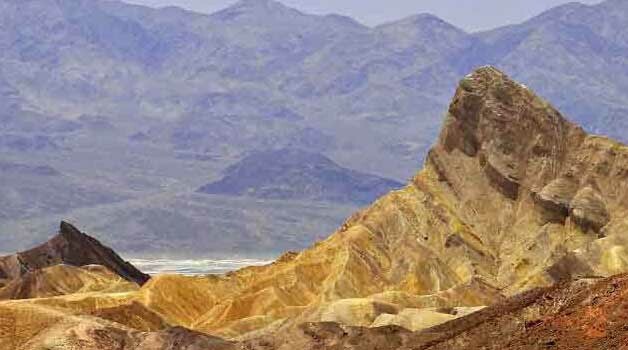 As you travel to Death Valley National Park you will witness all the splendor of the Mojave Desert as well as the moon-style landscape of erosional features at Zabriskie Point. When you enter the park you can gaze at the vibrantly colored rock formations of Artist’s Palette while you travel to the lowest point within the Western Hemisphere. Once at the salt flats of the Badwater Basin you can stretch your legs and take plenty of photographs at -280 feet below sea level before moving onward. After stopping and indulging in a free box lunch, your next stop will be at Furnace Creek where temperatures can reach as high as 135-degrees in the blistering sun. Here you can browse the gift shop as well as stroll through the historic Oasis at Death Valley Resort. Your Las Vegas to Death Valley tour concludes with drop-off service back at your hotel. Are you wondering what you might see during Las Vegas to Death Valley tours ? Here is a virtual tour - an itinerary plan in pictures of some points of interest in Death Valley you may visit (weather permitting). Please note that the actual tour may vary from provider to provider and may include only some of these Death Valley attractions. Not far from the Scotty's Castle, there is an interesting place known as Ubehebe Crater, that you will visit during a Death Valley tour. 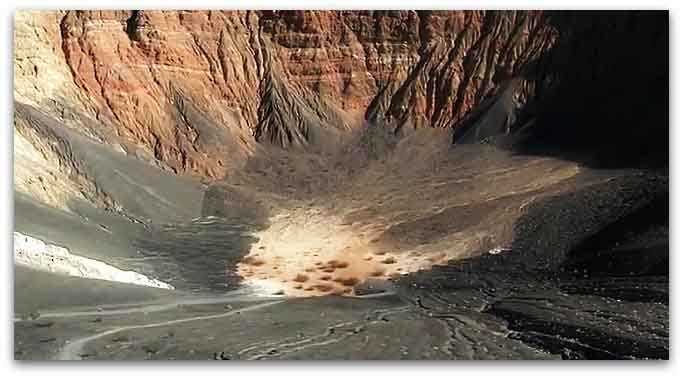 This Ubehebe Crater appeared as a result of a powerful volcano eruption - so strong that the volcano itself was destroyed. Although the crater is over 2,000 years old, it's considered young and therefore it's not yet covered with grass and bushes. 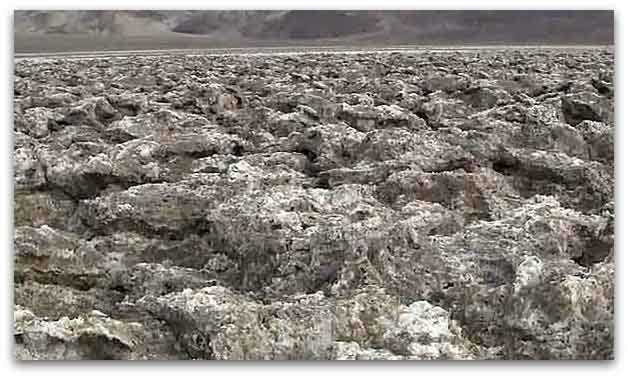 The Devil's Golf Course is an area that you might explore during Death Valley tours. This is a large plateau covered with dry salt crystals that grow upwards and create weird sounds that you can hear when the air stands still. 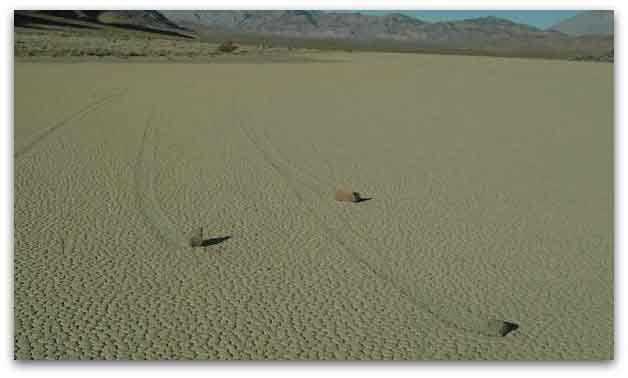 The Racetrack Playa is the most mysterious place in Death Valley - it's a flat, level plain of clay, around which are scattered so-called "sailing stones" that apparently move all by themselves, leaving prominent furrows, or tracks. Hundreds of stones of all sizes, from very tiny to huge ones, move in different directions. Sometimes the stones move alone, sometimes in groups. Scientists have been trying to explain this phenomenon, but years of research did not help to solve this mystery! 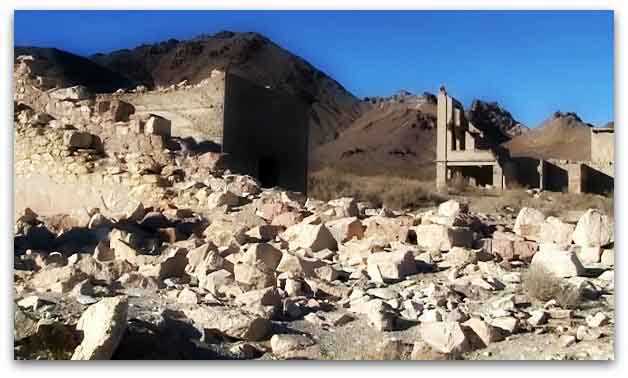 Another interesting stop during Death Valley tours from Las Vegas is the ghost town of Rhyolite. During Gold Rush, the small town was home to some 16 thousand people - gold miners and service providers who came here in hopes to get rich. Rhyolite developed very quickly in 1905, but declined almost just as quickly. When the main gold ore was exhausted, people started abandoning the town and in 1920 it was already empty. Close to the ghost town of Rhyolite, you will see a Goldwell Open Air Museum, created by Albert Szukalski, a sculptor from Belgium. 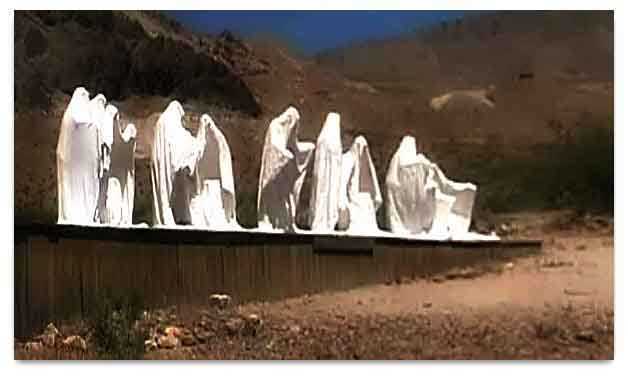 This is a museum of sculptures of ghosts, just in the spirit of an abandoned ghost town. Another likely stop during Las Vegas to Death Valley tours would be Furance Creek Ranch, where you will visit a small open air Borax Museum. Although the museum is small, it has some interesting historical artifacts such as wagons, carriages, and an old train. One of the highlights of Las Vegas to Death Valley tours, Scotty's Castle is a small oasis in the middle of a desert. The Castle, also known as the Death Valley Ranch, attracts visitors with it's Spanish-style architecture and beautiful green gardens. Scotty's Castle was built in the 1930 and is an engineering wonder, considering the times. It was equipped with a climate controlling system, electricity, water, and had a refrigerator storage. Inside the castle you will find Spanish carpets and curtains, Italian porcelain, Belgian lace and other riches. Due to flood in October 2015, Scotty's Castle is closed. 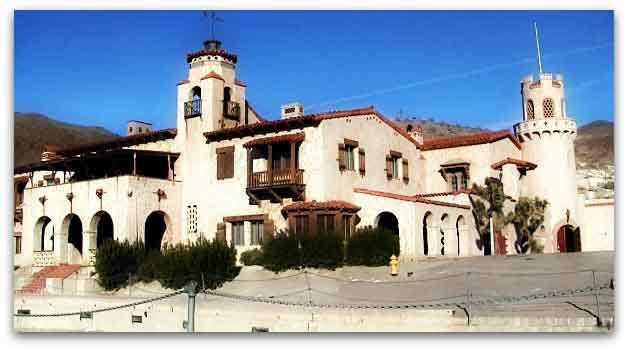 The castle has a very interesting history that you will learn during Death Valley tours. But to give you an idea - its history is connected with two people. The first was the actual owner of the house Albert Johnson, a financial magnate from Chicago who built the castle for himself and his wife Bessie. The second was an adventurous entertainer and story-teller Walter Scott, or Death Valley Scotty, who lured Albert Johnson into Death Valley with lies about a gold mine that he supposedly found. While there was no gold, Albert Johnson found something else in there - good health, and decided to move there permanently. And Johnson was actually amused and didn't mind a bit Scotty's stories that the castle is being built on the money he received from finding a gold mine, that Scotty told everyone around. Eventually, these two very different became friends and lived happily ever after together with Bessie in the castle.